How do you make the most of a writing conference? Picture this: you’ve saved your money, or you’ve scored an invite, and you’re off to a potentially career-changing conference or festival. What to pack? How to network? Which sessions to attend? You can’t be everything to everybody, and you can’t be in 20 places at once. If you want to optimise your time at a literature festival or writer’s conference, you’re going to have to prepare a game plan. When I walked into the 2014 Asian Festival of Children’s Content in Singapore, I was under-slept (who ever sleeps their first night in a hotel? ), over-burdened (laptop, jacket for the aircon, jacket for the rain, cords, chargers, a dozen pens) and nervous (did I mention nervous?). Well, for a start, I knew only 10 of the 2000 people expected to attend. Even thinking about that makes me sit up straighter. Plus, I had to choose sessions. There were four separate streams and dozens of topics in multiple venues, as well as a public program, masterclasses, and (note-to-self: don’t forget!) the sessions I was presenting. What if I chose the wrong session?? How could I make the best choice? Finally, I was presenting two sessions on vastly different topics: topic one, scary stories and topic two, children’s non-fiction. And let’s face it, preparation can combat nerves, but not entirely. I was stressing. Would I sink or swim? I was quietly nervous in the weeks and months leading up to the conference. I wanted to make optimal use of this opportunity, but how? I wanted to turn my useless nerves into actionable points, so I made a list. Months before attending the AFCC, I listed the things that were stressing me, then I worked out why they were stressing me, and I did something to make them less stressful. What is stressing me? My non-fiction presentation. Will it work? Should it be funnier? Or more academic? Combat stress: Get off your lazy rear and develop your presentation until you’re confident it will work. Result: Oh wow…I’m a million times less stressed now. In fact, I’m downright happy. Yay! What is stressing me? I’m rubbish at networking. I’m embarrassed by my business card. Combat stress: Create a business card that expresses what I do and who I am. Work out what it is I want to achieve when I’m networking. Result: Yee ha! 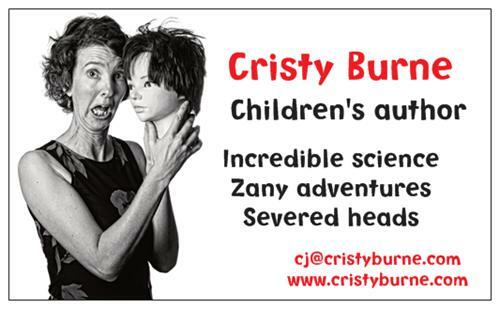 I’m in love with my business card and I can’t wait to give it away. Thanks to the amazing Brett Canet-Gibson from TWINE – IDEAS THAT BIND for the great portrait. And voila! The months and weeks leading up to the festival became a time of excitement instead of nerves. But that didn’t necessarily help the under-slept, over-burdened still-nervous me walking into the festival on Day 1….